TL; DR: For more than 15 years, Volusion has been helping small- and medium-sized businesses create effective eCommerce sites, helping merchants attract, convert, and retain customers. Out of the box, the robust site builder platform touts more than 900 features — from templates and design tools to an intuitive management interface and built-in SEO. It’s a comprehensive solution for SMBs to expand their brands’ reach. And all of this is made possible by a dedicated team that’s created a thriving company culture around a “bulletproof” product. It is no secret eCommerce is big business. According to a recent B2C article, all signs indicate 2016 will end with more than $1.5 trillion in online sales. It’s a competitive market for online merchants, and small- and medium-sized businesses are hungry to secure a share. A user-friendly, intuitive site with an effective SEO strategy is the path to grab a portion of those dollars, as Business.com tells us. However, many SMBs don’t have the resources to pour into creating SEO and marketing campaigns or laying out and designing multi-page eCommerce sites. Sarah E Lewis, Volusion’s Head of Partner Marketing, is proud of the turnkey site building platform her team created. Volusion provides a fully hosted platform that allows online merchants to easily design, build, market, and manage eCommerce sites from a central location. The platform is ready to go out of the box, so there is no need for users to search elsewhere for add-ons. Volusion’s dev team saw the need to produce a product that would most efficiently and effectively serve small- and medium-sized businesses and delivered a platform with more than 900 features that helps these businesses attract, convert, and retain customers. To create and maintain a site building platform that stays on top of industry trends and addresses the ever important issue of user experience is no easy task. Though, Sarah told us the Volusion team seems to do this with ease. The Volusion team is dedicated to constant improvement, Sarah said, and that’s why Volusion is constantly rolling out new iterations, adding new themes and templates, and, basically, looking to be a comprehensive solution for online merchants. Volusion is effective at simplifying online storefront creation mainly because they’ve listened to feedback from both merchant and consumer perspectives. The goal is to streamline the building and shopping processes to create sites that are easy to manage for merchants and a breeze to navigate for shoppers. Sarah noted Volusion’s dev team is motivated to make the best possible product rather than the “most branded or shiny product.” And that, she said, is the essence of the company. Indeed, what makes Volusion’s site creation platform so bulletproof are the multitude of features (more than 900!) it offers. Merchants can create storefronts from hundreds of ready-made design templates that translate across industries and are responsive across devices. Once sites are up and running, one of the most important items in Volusion’s toolbox is built-in SEO and marketing capabilities. 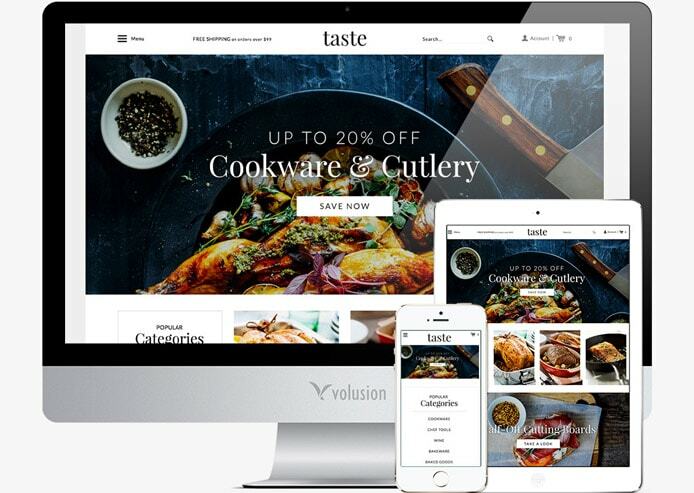 Volusion’s CMS works in the background to send information on products and sites to search engines, which helps boost site rankings and findability. Merchants can also embed YouTube videos to land their webpages, and video thumbnails, higher in organic search results. Other marketing tools include a ratings and reviews function, discount and coupon generators, and personalized email newsletter campaigns to drive business. Volusion’s 900+ features enable merchants to create online storefronts that translate across industries and devices. Volusion allows synchronization with Amazon, Facebook, and eBay, and integrations with MailChimp, FedEx, QuickBooks, and a host of other apps so online retailers can display products in their online stores to a wide audience. With such vast reach, Volusion’s management interface makes it simple to keep track of orders, inventory, and accept almost any payment method. If Volusion’s goal is to be a comprehensive, out-of-the-box solution for merchants to display, market, and sell products online, their extensive features offering surely puts them on the path to accomplish it. Behind Volusion’s successful platform is a team of more than 250 individuals who help create a thriving company culture. Sure, employees enjoy standard benefits, such as medical and dental insurance and a 401(k), but other perks really set Volusion apart from the pack. The company attracts the best of the best by offering paid parental leave, on-site fitness and yoga classes, casual dress Fridays, endless coffee and snacks, dry cleaning, team sports and outings, and — get this — unlimited paid time off! Volusion employees have created a thriving company culture around a “bulletproof” site building platform. “On Fridays, I can always count on there being dogs here, so I can roll around and play on the floor with dogs all day,” said Inola Mueller, Volusion’s eCommerce Support Team Lead. Inola really doesn’t play with dogs all day, though. She is responsible for ensuring ideal customer experiences and helping her team grow. The dogs just make it easier to do that by balancing an environment of work and play. So many online businesses are vying to be a part of the $1.5 trillion in online sales projected by the end of 2016. SMBs are sure to grab a share of that, and possibly even the lion’s share if they utilize tools such as Volusion’s platform. Volusion puts their money where their mouth is when it comes to serving the small and medium business community. In October, Volusion announced the sale of Mozu, their enterprise-level eCommerce platform, to Kibo. As Sarah explained, Volusion “killed it” with enterprise software, but they wanted to get back to the heart of what they do and streamline resources toward SMBs.